Superman has also inspired a number of songs, whether they are actually about his character ("Superman" by Five For Fighting), or whether they're invoking him as a symbol ("Kryptonite", 3 Doors Down). I quite like Five For Fighting's musical take on the character, which suggests that having all the power in the world doesn't make life any easier - in fact, it just saddles with you with even more responsibility. Lately, I have been listening to The Flaming Lips' The Soft Bulletin and one of the definite highlights on that album is "Waitin' for Superman", which uses the character as a symbol for the burdens of life and how we don't have a Superman here to help shoulder all our troubles. However, as sorrowful as it may be, it is also quietly optimistic, insisting that we be strong and all try to hold on as long as we can. The song was written about Wayne Coyne's own struggles in life at the time when his father was dying of cancer. He felt like the burdens of life were heavy, but realized that they would get even worse when his father succumbed and wished that there was someone there would could carry these emotions. I found a couple quotes about the song which I feel help to illustrate the power that Superman has, and how his absence is felt in our own lives. Killian Good says that "the song's central symbol is the absence of a real world Superman there to shoulder the burdens of daily life and right wrongs beyond human control. The piece is all at once sorrowful and optimistic. On one hand, the narrator admits there is no visible safety net to guard against man's fall, yet suggests simultaneously that we all, those waiting for Superman, might find strength and resilience in one another's arms, that salvation may live in love and understanding." Meanwhile, Michael Goldberg at MTV wrote that "when I listen to 'Waiting for a Superman,' two stories unfold. The first is about love. And about two people struggling to understand each other and come together and hang together through the good times and the bad times. The second is about death. About being there for a father or mother as life ebbs away." Of course, no discussion of Superman and music is complete without mentioning John Williams' theme song from the 1978 Superman: The Movie. I will occasionally throw this song on just to motivate myself. It's the perfect musical distillation of who Superman is - it's powerful, elating and makes you feel like you can do absolutely anything. There's a reason that this track has become so iconic, to the point where it is still being used in Superman media today. 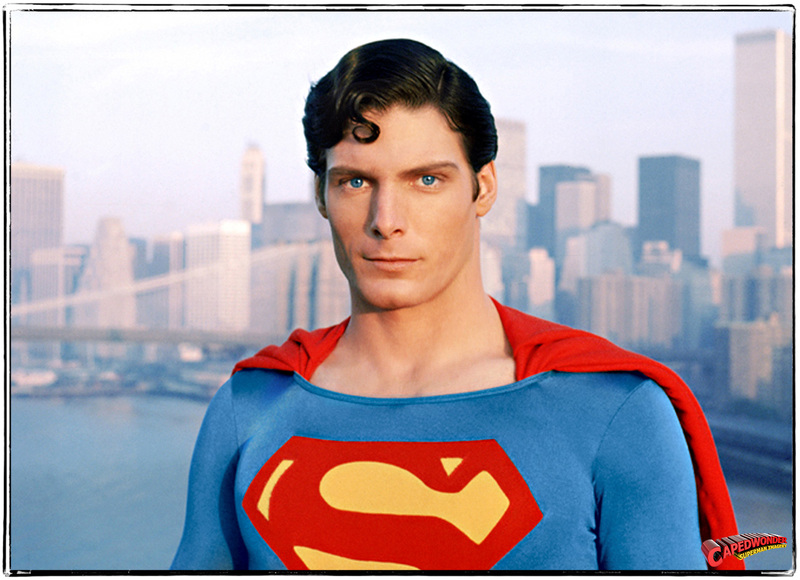 Personally, I feel like the 1978 film is the closest a live-action film has gotten to capturing that perfect essence of what makes Superman such a powerful character, with much of that praise going to Christopher Reeve of course. I enjoy Superman II quite a bit, but it isn't really on the same level in that regard. However, no other Superman film has really captured that spirit. Superman Returns tried to ape the tone of the classics, but it wasn't well-received for it. Worse, I feel like the DCEU incarnation of Superman has just gone in the wrong direction entirely. Man of Steel was criminally boring and wasted the strong potential it had to create a different, interesting and more grounded sort of Superman. 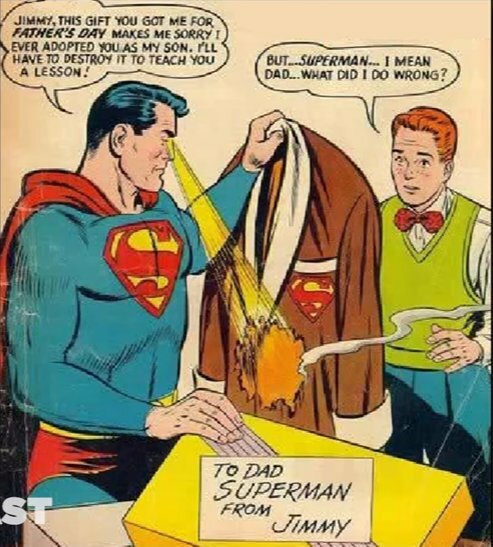 It pays lip service to establishing Superman's moral compass, but the films haven't done much with the character to make us care about him. Hell, making his first antagonist Zod was even worse because then off the bat we're getting another story about someone just as strong as him and watching them punch each other. This is a trap that poor Superman adaptations always fall into. 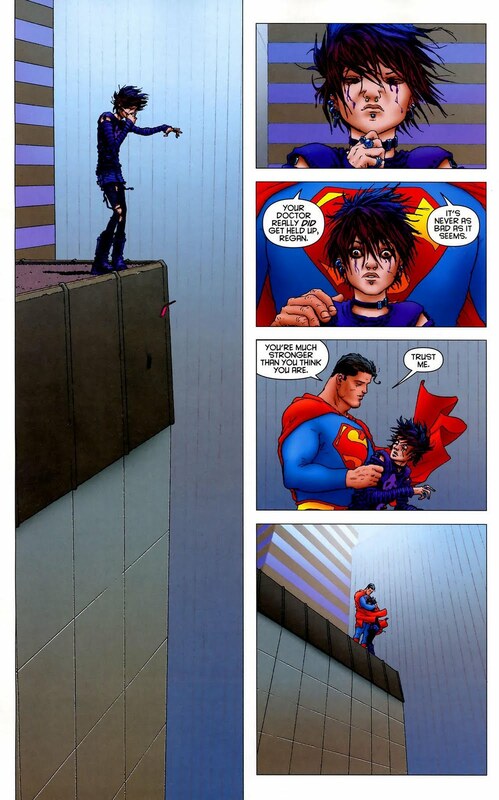 I feel like these 5 panels are a perfect expression of where the true power of Superman lies. Saving a life, even by just being there and knowing our hurts, that's the sort of thing that no other superhero can do. That is the power of Superman as a character. That is what good writing achieves for this character. Like, seriously, reading this page makes me tear up every time. David Fairbanks compares that to what a pulpier take on the character would have attempted: "Superman didn’t catch Regan’s body as it plummeted toward the ground; Regan was saved by Superman simply standing there on the ledge. [...] A stranger who cares. It’s that kind of outreach that can be vital to saving lives. And you don’t need to be a superhero to do it, either." We never get to see this kind of Superman in film - instead, he's either catching them as they fall or punching someone just as strong as him. This may be exciting, but it's easy and hardly inspiring. In my opinion, Superman works best when he isn't being treated like "just another superhero". For any other superhero, it's perfectly fine and reasonable to have the hero using their powers to face off against an equally-powered supervillain. However, because Superman is supposed to be the pinnacle of good, a hero with no limitations, attempting to treat him in the same manner is ineffective at best. Superman II is a fun beat-'em-up, but it's only as good as it is because of the personal crises that Superman goes through, wishing that he was human. Superman III and IV are awful simply because they revolve around plots to kill Superman which are obviously not going to be able to kill Superman. This was the Superman film I was originally sold on. There's no sign of a villain, but that teaser is so compelling. That is the kind of Superman film I wanted, one which establishes Superman's moral compass, his grounded upbringing, his worth to the rest of humanity. Instead, Man of Steel paid lip service to this before jumping into "empty-headed, violent spectacle for teenagers who think that darkness in a superhero story is evidence of serious artistic merit" within 30 minutes of its runtime. Had it stuck with the initial impression left by this teaser, perhaps we would finally have the Superman film to rival the 1978 original (or, hell, even Superman II). It's also worth noting how Clark Kent is treated throughout the DCEU films... or, should I say, effectively cast aside. Clark Kent is officially dead as of Batman vs Superman (aka, the 2nd film in this franchise), but he was never really all that important throughout this incarnation of the character anyway. Superman himself gets all the focus and Clark is very much sidelined. Hell, all the characters important to Clark know his true identity anyway, so he's not even important within the stories that these films are trying to tell - really, it's no wonder he was jettisoned this way. But losing Clark also loses out on some of the heart which a Superman story can tell and, in my opinion, potentially weakens the character's depth. "Superman didn’t become Superman. Superman was born Superman. When Superman wakes up in the morning, he’s Superman. His alter ego is Clark Kent. His outfit with the big red 'S', that’s the blanket he was wrapped in as a baby when the Kents found him. Those are his clothes. What Kent wears – the glasses, the business suit – that’s the costume. That’s the costume Superman wears to blend in with us. Clark Kent is how Superman views us. And what are the characteristics of Clark Kent? He’s weak, he’s unsure of himself, he’s a coward. Clark Kent is Superman’s critique on the whole human race." Neglecting the Clark Kent side of Superman is like ignoring his human side entirely. Clark helps keep Superman morally-grounded, but also provides him with a sort of mental escape from the life he leads. Superman II in particular succeeds as far as it does because it puts so much emphasis on Clark Kent - Superman often wishes that he could have a normal life, that he could just be Clark Kent. He loves Lois Lane and wants to be able to be with her, to act on his desires. Beyond that, the responsibilities of the world are just too much to bear at times, but he's the only one who can carry that weight, so he will do what is right to make that burden easier for others. And that's exactly the sort of core I'd work with if I was tasked to write a Superman story. There are a few directions you could go with a different and interesting Superman story. If you want an origin, maybe go with what Man of Steel's marketing suggested and make it about establishing his ironclad moral compass. However, I'm less interested in seeing Superman facing off against a supervillain than I am considering the idea of him grappling with the responsibility of being Superman. Many Superman films pay lip service to the character being a Christ-metaphor, but this should be leaned into more explicitly in my opinion. Superman can be Jesus without having to die for us - just look at that All-Star Superman panel earlier. Superman saves Regan by loving her and being there for her when she needed someone, much like the role Jesus plays in many peoples' lives. Superman doesn't have to be constantly swooping in and dazzling people with his displays of power, although when he does this should be inspiring people to be better. Superman should grapple with his inability to be there to save everyone. If he's out as Clark Kent and people are hurting somewhere in the meantime, he should feel the pressure from this. When should Superman intervene? Does Superman ever need a break? What sort of mental toll will that take on him? We need to see why he needs Clark Kent, why this human fantasy of his keeps him grounded, and actually make us feel like there's something between he and Lois Lane. That's before we even get into big-picture moral issues. I mean, forget about dramatic trifles such as whether to kill an alien supervillain - what about the implications of Superman interfering with world politics and inequality? Just look at what intervention in Iraq did, disrupting the existing power structures created ISIS (to put it simply). Would Superman force the world to be better? Would he just stand by and let people be downtrodden? Or would he pick people up one at a time? How would world governments respond to him? This sort of thing is totally glossed over in all Superman films so far, but it should be addressed, even if we just have Jor-El teaching Superman that direct intervention only causes more issues and that people will only respond if they're guided indirectly so that they accept positive change naturally. Regardless, the temptation to act is going to weigh on him. Basically, if we have another take on Superman, I hope they don't treat him like any other superhero, running around and punching bad guys. He has way more potential to stand out, because when he's treated the same, he just seems like a bland Mary Sue. Superman has his limitations, even without resorting to an artificial weakness or by powering up his problems. There are problems that even Superman cannot deal with, but he will try to face them regardless, because he is the only one who can try to bear that weight. He hasn't dropped them, forgot them, or anything, it's just too heavy for Superman to lift. I'm speaking as someone who dislikes Superman (if simply because of the moral conundrum that much of the writing about him presents) but your vision of a conflicted, just, and loving Superman is one I would really enjoy seeing.